There are a number of portraits of Arthur Ó Néill, though they may have been copied from one another. A different engraving was printed by Charlotte Milligan Fox in her 1911 book Annals of the Irish Harpers. I presume it came from Bunting’s manuscripts which she owned at that time. The caption says it was by T. Smith, Belfast. I think you can see it is very similar to Bigger’s engraving above, and I do wonder if both were engraved seperately bu different artists, based on the same (lost) portrait. 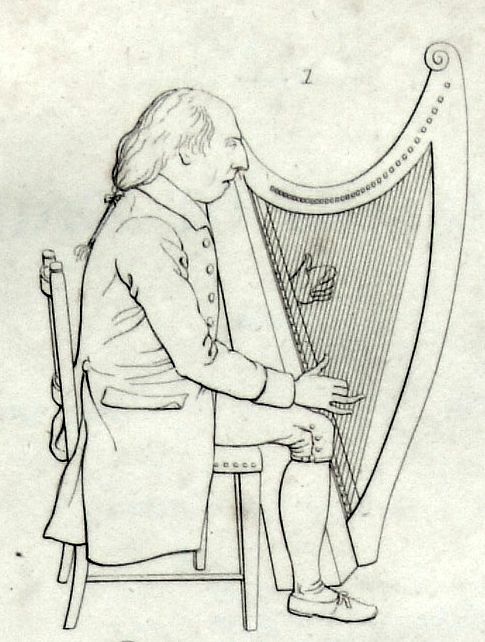 In his 1809 book The Ancient Music of Ireland, Edward Bunting included a small engraved portrait of Arthur Ó Néill. It's often assumed it is just a simplified line drawing from Smith’s engraving, but actually it looks to me to be a lot closer to Bigger’s engraving. 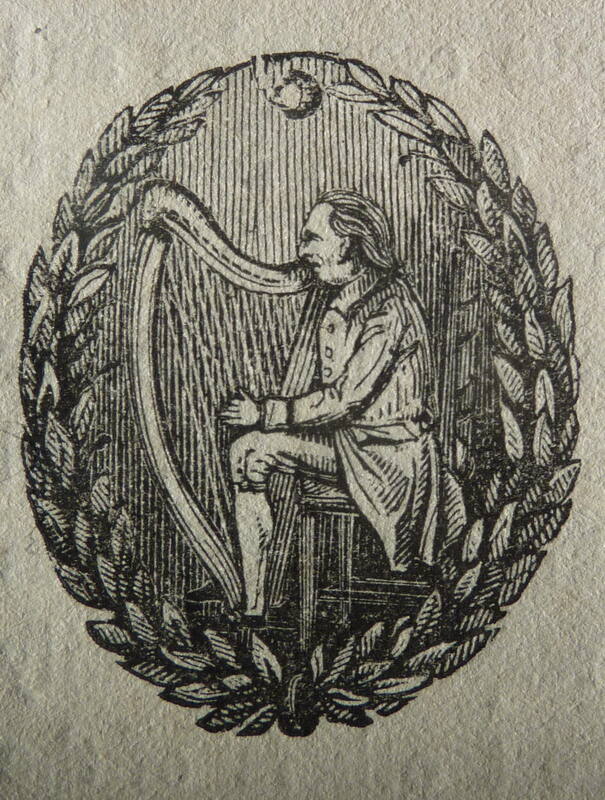 Bunting also included a very small engraved portrait in the introduction of his 1840 book, however this is just a rather crude copy of the other engravings as a decorative title and I don’t think it has much value as a portrait. There is a loose sheet by, or associated with, Edward Bunting, which includes a couple of charming caricature sketches of Arthur Ó Néill. One is labelled “thinking”, and another is captioned “laughing or smiling” with a speech bubble “mick how does my coat fit me”. There is a reproduction of the drawing in Brian Audley, ‘Some Missing Items of the Bunting Collection, Rediscovered’, Ulster Folklife vol. 49, 2004. The portraits face left; it is possible they are the model for the engraved versions. Many thanks to Libraries NI for allowing me to reproduce this image here, and for providing the scan of the manuscript which is held in the Bigger archive at Belfast Central Library. 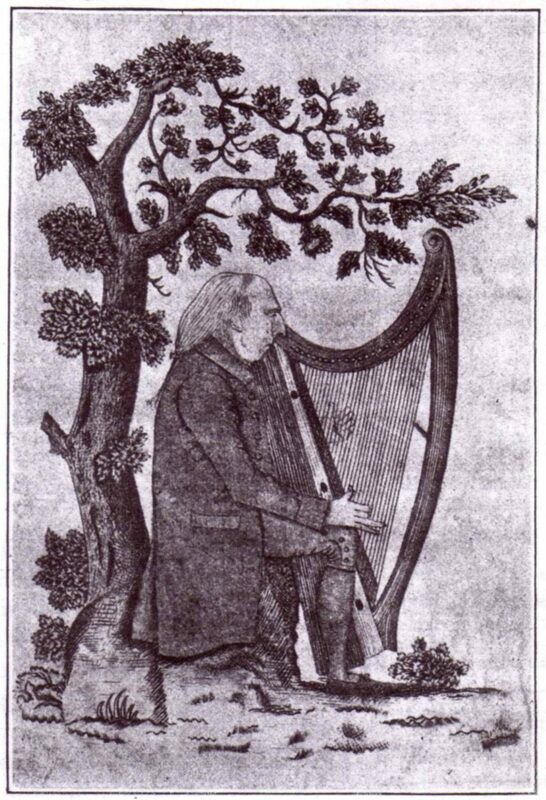 There is an 18th century oil painting by Conn O’Donnell, in the National Gallery of Ireland, which is often said to be of Arthur Ó Néill, though I don’t think this is true; the face looks different, and he has a different harp. The painting is currently in very poor condition and the National Gallery has been unable to supply me with a colour photograph of it. Breandán Breathnach printed a black-and-white copy of the portrait in Ceol, Winter 1963, where he said it was of Cormac Ó Ceallaigh, but I don't know the reason for this identification. A black-and-white reproduction was also printed in Early Music May 1987 (frontis) where it was identified as Arthur Ó Néill, and similarly also in Collette Moloney, The Irish music manuscripts of Edward Bunting, ITMA 2000, and Nicholas Carolan, The most celebrated collection of Irish tunes, ITMA 2010. Many thanks to the Irish Traditional Music Archive for supplying me with a scan of the reproduction in Ceol and giving me permission to reproduce it here.